The recently-disbanded mounted police unit in Nottinghamshire would cost more than £400,000 to reinstate, according to the county's chief constable. The seven-horse unit was closed by the police commission in 2012. Newly-elected police and crime commissioner Paddy Tipping is asking for public feedback to see if the unit should return. Mr Tipping promised to hold a consultation on the issue during his election campaign. A new report from Chief Constable Chris Eyre estimates the cost of rehiring officers and buying new horses would cost £420,000. Mr Tipping has asked for comments on the new report in an online survey on the commission website. 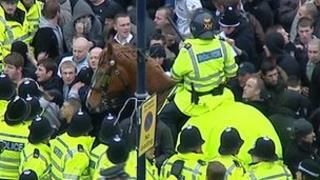 Mr Eyre's report said: "The mounted section was seen as a hugely desirable resource for the force, but not essential." Mr Tipping said he has not made a final decision on the future of the mounted unit, which, if reinstated, would be funded from the force's budget which will be set at the end of January. "It is a big sum of money in the context of a police force where I want to get more uniformed officers back on the beat - it is a stark choice that has to be made," he said. "Do people want more officers on the beat or do they want the mounted section back - that is the choice." The disbanding of the unit saved £100,000, but reforming it would cost four times as much because new horses would need to be purchased and new officers hired to staff the unit, Mr Tipping added. The unit was mostly used for crowd control during major public events, such as football matches.